National Poetry Month (NPM) is the largest literary celebration in the world, with tens of millions of readers, students, K-12 teachers, librarians, booksellers, literary events curators, publishers, bloggers, and, of course, poets marking poetry’s important place in our culture and our lives every April. Connect2Culture, Post Art Library, and Pub Hound Press began an intentional collective effort to celebrate NPM in Joplin in 2016 and 2019 marks the fourth year of Joplin’s official celebration. NPM mainstays were collected (such as Spiva’s 1,000 Words Event) and the committee rounded out the lineup by adding new poetry-centric events (such as Open Mic Poetry Night). Take a look at this year’s lineup below and join in the poetry-fun! Tuesday, April 2 | 7:00pm: Alan Berecka at Missouri Southern State University, Spiva Library, Rm 413 (3950 Newman Rd). The Saltzman Series of Visiting Writers presents poet Alan Berecka. Berecka is a Pushcart-nominated poet, librarian, and the first Poet Laureate of Corpus Cristi, Texas. He is the author of Comic Flaw, Remembering the Body, With Our Baggage, and The Hamlet of Stittville. More information: Joey Brown, brown-jr@mssu.edu, 417.625.9377. Monday, April 15 | 6:00–8:00pm: Downtown Poetry Reading at Joplin Avenue Coffee Company (506 S Joplin Ave). April’s downtown poetry reading will feature Dr. Lisa Lewis. This event occurs on the 3rd Monday of each month. Throughout the month, see their facebook page for weekly writing prompts in honor of National Poetry Month. For more information, emailDowntownPoetry@gmail.com. Tuesday, April 16 | 6:30pm: 1,000 Words Event at Spiva Center for the Arts (222 W 3rd St). They say a picture is worth a thousand words, so tell us all about it! Produce poetry or prose by drawing your inspiration from one to two photos exhibited for PhotoSpiva 2019. Participants can share their works with the public during readings in the Main Gallery. These readings will be displayed through QR codes along with your chosen exhibition photo. Sign-ups begin March 23. Cost: Free. More information: Jade Henning, jhenning@spivaarts.org, 417.623.0183. Thursday, April 18 | 5:30–8:30pm: National Poem In Your Pocket Day at Third Thursday (Main Street in Downtown Joplin). On Poem in Your Pocket Day, people celebrate by selecting a poem, carrying it with them, and sharing it with others throughout the day at schools, bookstores, libraries, parks, workplaces, and online. Pocket poems will be distributed during Downtown Joplin’s Third Thursday and at venues throughout Joplin all-day! This is a collaborative celebration for National Poetry Month led by Connect2Culture, Post Art Library, and Pub Hound Press. Friday, April 19 | 7:00pm: Open Mic Poetry Night at Joplin Empire Market (931 E 4th Street). Write poetry? Love poetry? Come recite a poem you’ve written OR one by a poet you love. Feel free to bring some craft beer or a bottle of wine to share. This is a 21+ event. Free admission. OMPN is a collaborative endeavor to celebrate National Poetry Month between Connect2Culture, Post Art Library, and Pub Hound Press. More information: Emily Frankoski, emily@connect2culture.org, 417.625.6683. 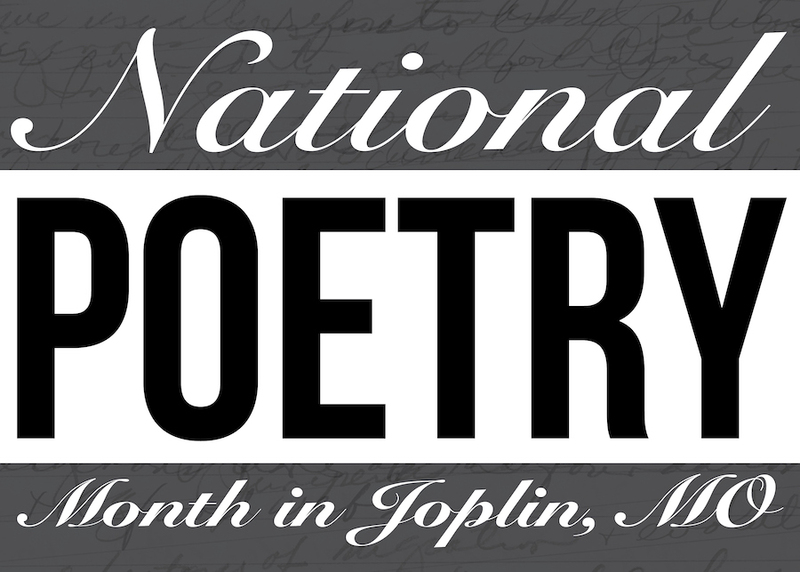 Click here to download the official National Poetry Month in Joplin, MO poster.